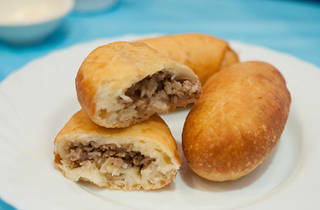 These pint-sized pies are a Russian specialty, providing a perfect antidote for bad weather blues. The Russian Club in Strathfield has seen better days, but it remains a social hub for the Russian community in Sydney. The restaurant is eerily quiet, but we’re told that Sunday lunchtimes are usually the busiest. In a suburb now teeming with Korean, Vietnamese and Indian restaurants, the Russian Club is now a sentimental, if struggling, reminder of the area’s Eastern European past. 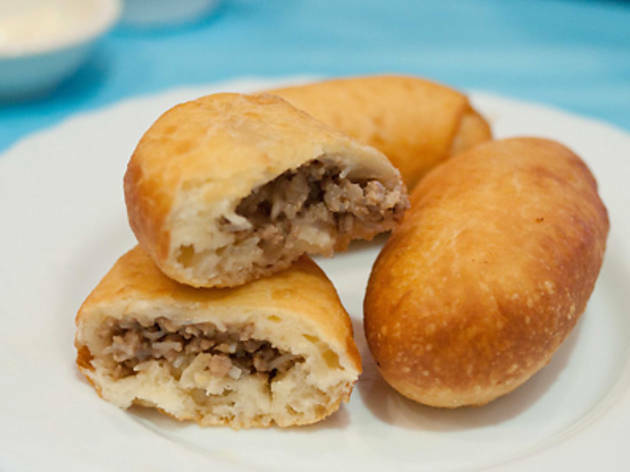 The piroshki ($2 each) are one of the highlights here, the yeasted buns soft and fluffy and fried so the outer layer develops a thin, golden crust. Inside is a hot filling of minced meat and vermicelli noodles that tastes even better with a splodge of chilli sauce on the side. The décor may be rooted in the ’70s, with fanned napkins and blue plastic sheeting draped over white tablecloths, but happily for your wallet, the prices are just as historic. A trio of homemade cabbage rolls are a steal at only $9. It’s a feast of minced meat and rice wrapped up in cabbage leaves and cooked in a tomato sauce, served with a flourish of sour cream and fresh chopped dill. Pelmeni ($7) are also hefty in serve, a plate of about twenty boiled dumplings folded into tortellini parcels. Each holds a spoonful of mixed pork and beef mince, best dunked into sour cream before eating – just like the Russians do. The crowd may be predominantly Russian but they all want Chinese food, says the chef. A plate of stir-fried tofu, zucchini, red capsicum and carrots ($9) wouldn’t look out of place at your local Chinese, even if it is a little on the oily side. Not everything is available on the menu, but you should be well looked after by staff who’ll feed you with whatever they have in the kitchen. Finish with a cup of tea and a slice of honey cake ($3.50) filled with cream.